In my previous post (link here) I outlined what a Sparkline was and how to insert one into your worksheet. 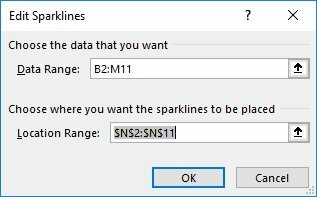 In this post, I’d like to look at how to customise the sparkline. Once you have inserted a Sparkline into your worksheet, you will see a new group of tools appear on the Ribbon. The Sparkline Tools > Design tab will allow you to edit various aspects of any Sparkline. This tab is referred to as a “contextual tab” which means it will only appear on the Ribbon when a cell containing a Sparkline is selected, or in other words, it will appear only in the context of what it’s used for. As soon as you select a different cell the tab will disappear from view. 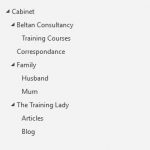 It’s important to be aware that if you have used the AutoFill technique to create Sparklines for an entire column or row (referred to as a Sparkline group), any changes to various aspects of one sparkline will automatically fill through to those subsequent sparklines within the group. Later in this post, I will show you how to ungroup Sparklines which will allow you to edit each individually. 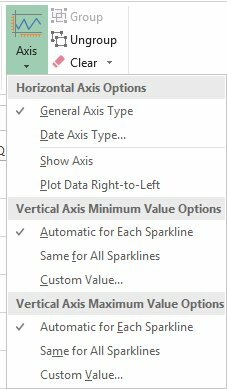 If you wish to add or remove data being included in a particular Sparkline, you can easily do that using the Sparkline Tools > Design tab. If you wish to change the type of sparkline you have included, you do not need to delete the existing sparkline and create a new one, you can simply edit the type using the Sparkline Tools > Design tab. Excel allows you to highlight various aspects of a Sparkline to make the data stand out and appear more defined. 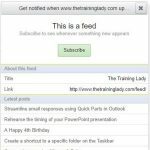 Use the Show group to highlight aspects including High Point, Low Point, Negative Points, First and Last Point and all Markers. By default, any Sparkline you insert will use the default colour schemes, but let’s be honest, they can be a bit boring. To “jazz up” your Sparkline use the Style gallery to choose a different colour scheme. The Group objects give you the ability to adjust multiple settings within the sparkline. If you are using data based on dates then select the Date Axis Type so that your Sparkline will demonstrate any gaps in your data based on dates. You will be prompted to select the data range containing the date values. In the example below, you can see the dates are 1, 2, 5, 6, 10, 11, 12 January. The data has gaps within the dates and by using the Date Axis Type you can now see corresponding gaps in the Sparkline. If you have created a sparkline and then used the AutoFill tool to copy the sparkline to other cells you will find that the sparklines are now grouped together. Any formatting changes made to a Sparkline within the group will see the change applied to all sparklines within the group. Whilst this does have its advantages you may need to be able to edit sparklines individually. You can do this by ungrouping sparklines from the main group. Vice versa, if you’ve created sparklines individually and wish to edit them as a group, you can easily perform this. To delete a Sparkline you will need to use the Clear button. It doesn’t matter how many times you press the Delete or Backspace key, the Sparkline will remain, this was my instinct when trying to get rid of my first sparkline. 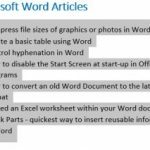 I hope these tips have been helpful for utilising the Sparkline feature within Excel. Sparklines provide an amazing way to visually represent trends within your data. 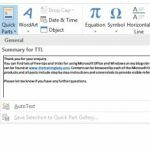 Be sure to check out my other Excel based articles.